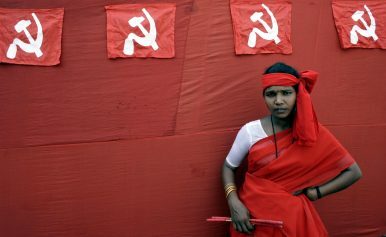 A woman Naxalite waits before her performance during a protest rally to mark 40 years of the Naxalbari movement in the eastern Indian city of Kolkata May 25, 2007. Once present all across the globe, Communist guerrillas and their armed offensives against governments had shaped much of the 20th century. From small bands of deadly fighters to full-fledged armies with combatants numbering in the thousands, such groups once held significant firepower and control of land across Latin America, the Middle East, Asia, and Africa. But as things stand today most of these groups have either been crushed, chosen the ballot over the bullet, or have withered into political irrelevance. Bucking that trend, a protracted people’s war has been running for the past 50 years between Maoist guerrillas and the Indian government with no end in sight. In fact, with anywhere between 8,000 and 10,000 regular troops in its guerrilla army and nearly 40,000 cadres in the people’s militia, the Indian Maoists are the largest organized Communist fighters outside of the Syrian YPG. The Maoist party was the result of multiple splits and fratricidal wars inside the Indian communist movement. The first Communist Party of India (CPI) was formed in 1920 under the aegis of the Soviet regime at a meeting in Tashkent. Following India’s independence in 1947, when the Soviet apparatus supported the centrist Indian National Congress, the CPI followed suit. This led eventually to an acrimonious split, from which the Communist Party of India (Marxist) was formed 1964. But within three years of that split, the CPC managed to engineer another. Led by a man named Charu Majumdar (then member of the CPI-M), this new group rejected elections and opted for Mao Zedong’s “protracted people’s war” doctrine. The group’s first altercation with police took place in a small sub-Himalayan hamlet called Naxalbari during a violent protest of peasants against a landlord said to be extracting heavy rates of interest from them. The 1967 Naxalbari uprising, (during the first Left Front Government in West Bengal of which the Home Minister was CPI-M stalwart Jyoti Basu – blog editor), was quelled quickly. Majumdar was captured and killed in police custody in Calcutta soon after. But the movement had electrified hundreds inside the ranks of the communist party and soon groups emerged across the country pledging themselves to the “Naxalbari path.” And attesting their loyalties to the CPC, slogans of “China’s Chairman is Our Chairman” appeared on walls in Calcutta, Bombay and Hyderabad. Following Mao’s death and China’s abandonment of sponsoring international revolution, the movement broke down into a chaos of splinters and factions that named themselves in an almost incomprehensible alphabet soup. By some estimates, during the 1980s, as many 149 Naxalite parties functioned independently, with each claiming to be the true flag-bearers of the Naxalbari legacy. Some, like the Communist Party of India (Marxist-Leninist) Liberation, went back on the plan for an armed insurrection and returned to elections. But two major groups stuck to their guns: the Maoist Communist Centre (MCC) in areas adjoining Nepal and the People’s War Group (PWG) in the areas that made up the princely state of Hyderabad (modern day Andhra Pradesh and Telangana). The MCC and the PWG were the largest, most organized and best-armed. They maintained links with international groups like the Revolutionary Internationalist Movement (RIM) and Coordination Committee of Maoist Parties and Organizations of South Asia (CCOMPOSA). But a bloody territorial feud between the two parties, combined with a state crackdown, kept them apart, and occupied with maintain their own territory. This situation lasted until September 21, 2004, when the two groups merged and formed the new Communist Party of India (Maoist). The combined force is now the single largest armed group operating inside India. The fight in Naxalbari in 1967 was about who had the right to farm produce. The Maoists say the essence of their people’s war remains the same – only farm produce has been replaced with minerals and the landlord with mining corporations. While the ranks of civil rights activists and Maoist watchers in India are divided over the Maoists’ choice of using violent means, there is almost no disagreement that their cause is rooted in the pushback against unscrupulous exploitation of forest lands and the displacement of tribal populations for the sake of mineral ore.
Little wonder that the Chota Nagpur and Orissa plateaus — loaded with 93 percent of the country’s iron ore, and 84 percent of its coal — have become home to mining behemoths turning up every square mile of the plateaus hills, forests and rivers. And it is these exact areas that form the core zone of Maoist conflict. India’s mining industry has, in fact, been rife with systemic corruption. With little to no government oversight or regulation, regional satraps and families with political clout have pilfered ore at prices below international market rates and above legal quotas and faced no legal action. The effects of this are borne out by the fact that despite the boom in mineral excavation and sales in India, the mining industry’s contribution to the economy has been lackluster and its share in the GDP has stagnated at 2.2-2.5 percent for more than a decade. Moreover, India has been experiencing jobless growth for a long time and when it comes to unemployment and low wages, the regions in the Maoist conflict zone are some of the worst affected. The Indian authorities, however, have turned a blind eye to this exploitation and chosen to pursue a purely military approach to the situation. 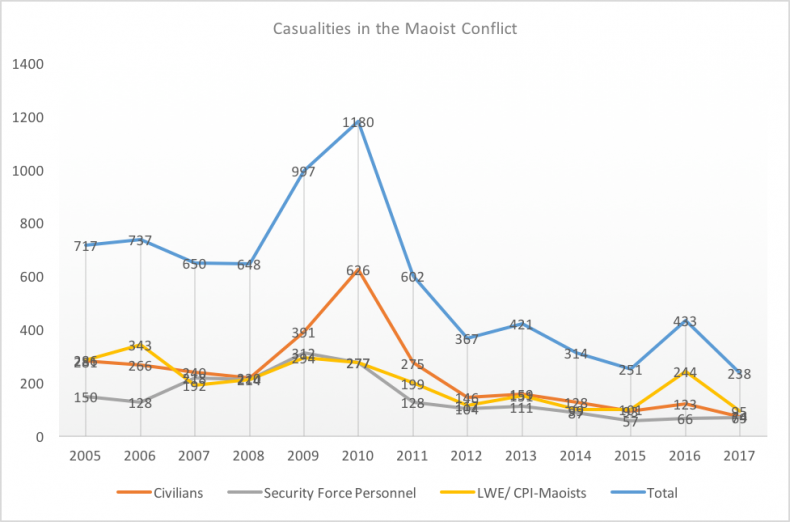 In April 2006, Indian Prime Minister Manmohan Singh, a celebrated “moderate,” described the Maoists as the “single biggest internal security threat” — underscoring the country’s adherence to seeking a purely military solution to the conflict. Thereafter, Singh proceeded to allot a special budget for providing combat assistance to districts where Maoists were present. A rapid militarization of the police was undertaken and armories were upgraded with drones and other equipment designed for high-intensity warfare. Traditionally, anti-Maoist activities had been under the purview of civilian police and the central paramilitary forces. But Singh — for the first time — tried roping in the Indian military. Ideas like the bombing of Maoist strongholds floated around New Delhi’s power circles. The move was decried as overkill and unethical. Singh’s cabinet didn’t find adequate support for this even in the ranks of his own party. Moreover, the Indian Army publicly expressed its reluctance to get involved in domestic issues and turn its guns on citizens. The infamous “Salwa Judum” (meaning purification hut) militia, headed by tribal leader Mahendra Karma, was a result of this move. Karma had been a former member of the Communist Party of India but had rapidly risen through the ranks of power by switching sides and going over to the centrists, the Indian National Congress. Before long, violence spiraled out of control and the Salwa Judum came under international scrutiny for gross violations of human rights and employment of child soldiers. Acting on a petition moved by the People’s Union of Civil Liberties in India, the Indian Supreme Court declared it illegal in 2011. Soon after, the Maoists too hit back violently by assassinating Mahendra Karma and clutch of other leaders of the Indian National Congress. Between 2005 and 2017, the body count on both sides of the people’s war, and of the civilians caught in the crossfire, has ebbed and flowed. 2010 was the bloodiest year in this span. That year, fighting left over a thousand people dead. But with the exception of 2016 (due to one major ambush) the number of casualties has experienced a gradual but steady decline. But this is more the result of a stalemate, than a situation promising peace. In fact, lasting peace has remained elusive for a variety of political, social and economic reasons. Cherukuri Rajkumar, known as Azad, was a member of the Central Politburo and the spokesman of the Communist Party of India (Maoist). Reportedly, in 2010 he was supposed to be heading peace negotiations with the Andhra Pradesh government. But for reasons that remain unknown, talks ended abruptly and Azad was killed in an encounter with the police. A journalist and a mediator were also killed. The police said a gun battle had ensued and lasted through the night. Protests erupted in several quarters, with critics of the government saying that the police’s claims were fake and that Azad and the others were killed in cold blood. Yet things aren’t quite as straightforward as the Maoists offering peace talks and the government rejecting or betraying them. The Maoists have from time to time tried to play kingmaker by intervening in the competitions between democratic parties. Stepping in during crucial elections, they have on multiple occasions used their firepower to sway results in one direction or the other. For example, in 2007, the Maoists played a key role in bringing down the 34-year run of the Communist Party of India (Marxist) as the ruling party of West Bengal. (The CPI-Marxist had already been discredited amongst the ordinary people of W Bengal- blog editor.) Involving themselves over a land acquisition dispute in Nandigram, Maoist guerrillas declared war on the Marxists and killed and drove members out of their homes in large numbers. This led to a landslide win for the opposition leader, Mamata Banerjee. The operation was led by famed guerrilla leader Mallojula Koteswara Rao a.k.a Kishenji. But soon after the election, Banerjee’s administration engineered Kishenji’s assassination by winning over one of his trusted aides. The Kishenji episode wasn’t an isolated case. Across Bihar, Andhra Pradesh, Chhattisgarh and Orissa, the Maoists’ experiments at working as hired guns for big players have resulted in losses for the group. The Nepali Maoists having given up their armed efforts, and the CCOMPOSA and the RIM have ceased to be functional, effectively leaving their international links dry. The acrimonious recent past the Indian Maoists share with the other communist parties has made them pariahs in mainstream leftist collectives. Moreover, unlike the other communist parties that have strong presence in trade unions, student unions, farmer collectives and other mass organizations, the Indian Maoist party has little more than their guns. This has resulted in political isolation, and locked them inside the conflict zone. “The challenge to the Maoists comes as much, if not more, from satellite television and mobile telephony as it does from the Indian armed forces,” Siddharth Mitra, a New York-based human rights activist and Maoist politics watcher, says. Like elsewhere in the country, rising aspirations for urban life among the younger generations of the tribal people has rendered older methods of public outreach by the Maoists ineffective. And this has in turn catalyzed the shedding of past cultures in favor of the more homogenized, pan-Indian one. This alienation and disillusionment can be gauged from the rising number of surrenders among the Maoist fighters. Tired of an itinerant life in the jungle, scores of mid-level leaders and fighters have deserted their brigades in the past five years and chosen salaried wages and family life instead. This in turn has led to the Maoists recruiting teenagers as combatants to fill the gaps. The desertions notwithstanding, India’s changing political climate may indirectly be breathing fresh life into the Maoist movement. In May 2014, the Manmohan Singh-led Congress Party was voted out and Bharatiya Janata Party (BJP) leader Narendra Modi took over the prime minister’s office. Buoyed by an absolute majority in the lower house of the parliament, Modi and his cabinet have pursued a hardline Hindu nationalist agenda. Critics say Modi has leaned on Hindu supremacist politics and the muzzling of dissent. This has led the opposition to grow closer and begin coordinating among themselves. Centrists, liberals, communists, Dalits, Muslims, feminists and a sweeping brush of the political-ideological spectrum on the Left have come together to push back against what many see as an onslaught of the Right. Lankesh was the Bangalore-based editor of a Kannada-language daily that had good readership among the working class and took a strident anti-Right line. Lankesh spoke out against Modi and his politics from multiple public platforms and had been openly threatened by Modi’s supporters. Shot dead at the gate of her home by “unknown” assailants, her death was openly celebrated on social media by supporters and followers of Modi.